It’s a long game. Patience is key. Jared talking with a design leader to help him build out his organization’s UX strategy. Practically every week, I find myself standing in front of design leaders saying the same thing: If at any point, I gave you the impression any of this would be easy, I apologize. It’s not. Good design is hard. It’s even harder to establish a user experience strategy for producing great products and services. We can make it easy to identify which strategies our organization would most benefit from. 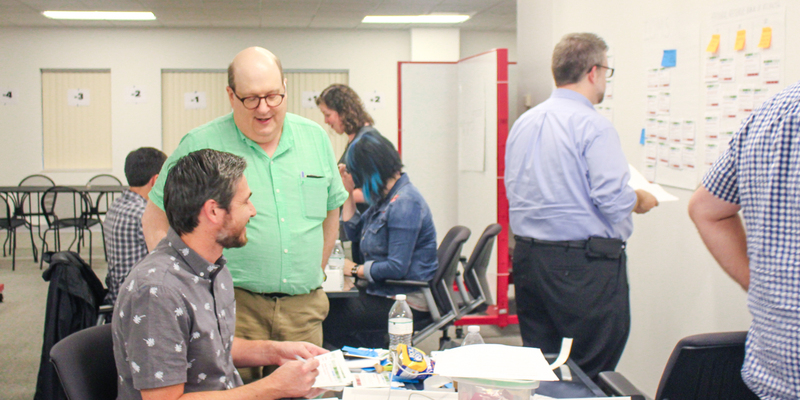 (In our Creating a UX Strategy Playbook workshop, teams do it in just 2 days.) However, putting those strategies into action and achieving the desired outcomes—that’s harder. A solid UX strategy moves the needle in the organization. It pushes every decision influencer to be more design literate and fluent. Better informed decisions enhance a design’s user experience. None of this happens overnight. We can decide if a design system is a good UX strategy for us. However, we need time to craft a new design system, disseminate it, and get everyone using it. Plus, we don’t just need them using it. We need them using it well. That requires even more time and effort. We can decide if more exposure to users and customers is a good UX strategy for us. However, putting a plan into play that gets developers, product managers, and other stakeholders in front of users takes time and effort. Design leaders must have the patience to see each strategy through. Patience does not come naturally. Patience is a learned skill. Any new UX strategy is a change. And the organization is resistant to change. Patience is the antidote to an organization’s natural resistance. Design leaders find patience by having a clear picture of where they’re trying to go. They know, from the moment they start executing a strategy, what they want that strategy to achieve. They know what the end game looks like. They bring their team along. They make sure their team also knows what success looks like. Because the team has a clear picture of the objectives, they can see progress. They can make adjustments when progress starts to stall. As with many things, balance is important. A design leader needs to know when to act. They must also have the patience to wait and allow a strategy to progress further. Sometimes, it’s in the moments after our intuition has told us to stop that we learn what we need to know to make things better. As design leaders, we need the patience to see our strategies through. That’s how we deliver better-designed products and services.